Superb spacious four bedroom detached dormer bungalow residing on a substantial corner plot enjoying fantastic views over open fields and having been modernised by the current vendors benefiting from modern en-suite bathroom, additional family shower room and stunning contemporary high gloss dining kitchen with solid walnut work surfaces. Also having uPVC double glazing, gas central heating, garden to three sides and integral garage. The property resides on this highly regarded road within Spinkhill enjoying a semi-rural setting and close to local amenities including shops and schools. The motorway network, Sheffield and Chesterfield are within easy travelling distance. A uPVC door opens into the hallway having fitted carpet to the floor and central heating radiator. Stairs rise to the first floor landing. 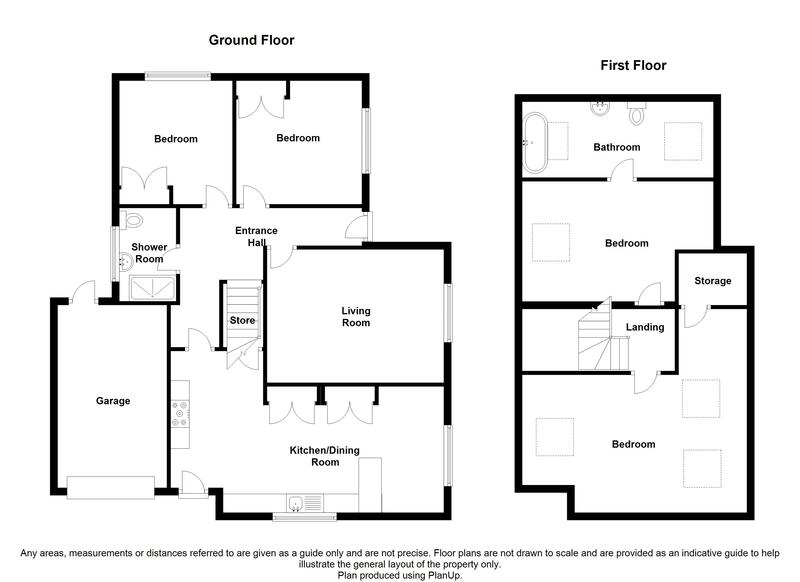 With a front facing uPVC double glazed window, central heating radiator, coving and inset downlighters to the ceiling. The room has been decorated in neutral shades and there is fitted neutral carpet to the floor and TV point. The double aspect room has front and side facing uPVC double glazed windows letting in plenty of natural daylight. Having a substantial range of white high gloss wall, drawer and base cabinets, complementing solid walnut work surfaces extend to create a breakfast bar with stool space beneath. Also incorporating a four ring gas hob with glass splashback panel, glass angled extractor hood above and two separate eye level inbuilt electric ovens, further integrated appliances include the dishwasher, fridge freezer and automatic washing machine. There is ceramic tiling to the floor, inset downlighters to the ceiling and two central heating radiators. Set beneath the front facing uPVC double glazed window is a composite sink and drainer with mixer fitting. A part glazed uPVC door gives access to the front, ample space for dining table and chairs and useful inbuilt storage cupboard. Having a uPVC double glazed window, central heating radiator, fitted carpet to the floor and fitted wardrobes. With a uPVC double glazed window, central heating radiator, inset downlighters to the ceiling and fitted carpet to the floor. Also having a range of floor to ceiling fitted wardrobes. With a double width shower cubicle, white wall mounted wash hand basin and low flush WC. Also having under floor heating, chrome ladder radiator, ceramic tiling to all walls and floor. Inset downlighters to the ceiling. Stairs rise to the first floor landing having velux skylight and inset downlighters to the ceiling. The master bedroom has twin velux skylights and further side facing uPVC double glazed window, central heating radiator, recessed spotlights to the ceiling and fitted carpet to the floor. Having a white suite comprising bath, wall mounted wash hand basin and low flush WC. Ceramic tiling to the splashbacks and floor, chrome ladder radiator and inset downlighters to the ceiling. Having twin velux skylights, central heating radiator and fitted carpet to the floor. Residing on a substantial corner plot with gardens to three sides. The front and side gardens are mainly laid to lawn and a stone walled rockery is planted with a variety of flowers and shrubs. The rear garden is lawned and enclosed with a combination of natural hedging and timber fencing. A large patio area provides space for outside dining and additional seating. The integral garage has up and over door, power and light.